Please use this thread (located in the 100% Moonlight forum) to post links to polls that are about Moonlight and its wonderful characters. We have created a thread in the Alex -> General Discussion forum for polls about Alex as an actor, and if you would like a thread created for polls about any other favorite Moonlight actor or actress, please let us know and we will be happy to set them up for you in the appropriate location. Forbidden romance, a crime procedural, vampires — Moonlight had it all! Perhaps that's why why so many of our users are still mourning its departure, especially with that cliff-hanger ending! 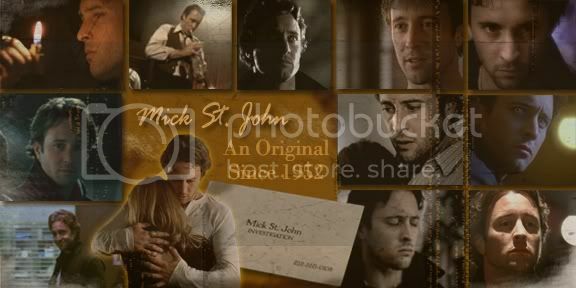 Since it went off the air in 2008, fans haven't stopped hypothesizing about how Talbot's discovery of Mick's true nature would affect his future (and more importantly, his budding relationship with Beth!). Plus, any excuse to bring Jason Dohring back on TV is fine by us. Even though there is zero chance of it happening, it's nice to know that the ML love is still out there far beyond these virtual walls. And on that last line. Ahh, that's nice. And well, for the last line! I dunno, most of the comments were supportive. Yes, there are always a few naysayers, but mostly it was ML love there. I didn't think the comments were that bad, even the negative ones. People are entitled to like what they like.